Logging is the cutting, skidding, on-site processing, and loading of trees or logs onto trucks or skeleton cars. In forestry, the term logging is sometimes used narrowly to describe the logistics of moving wood from the stump to somewhere outside the forest, usually a sawmill or a lumber yard. In common usage, however, the term may cover a range of forestry or silviculture activities. Illegal logging refers to what in forestry might be called timber theft by the timber mafia. It can also refer to the harvesting, transportation, purchase, or sale of timber in violation of laws. The harvesting procedure itself may be illegal, including using corrupt means to gain access to forests; extraction without permission or from a protected area; the cutting of protected species; or the extraction of timber in excess of agreed limits. Clearcut logging is not necessarily considered a type of logging but a harvesting or silviculture method, and is simply called clearcutting or block cutting. In the forest products industry logging companies may be referred to as logging contractors, with the smaller, non-union crews referred to as "gyppo loggers." Cutting trees with the highest value and leaving those with lower value, often diseased or malformed trees, is referred to as high grading. It is sometimes called selective logging, and confused with selection cutting, the practice of managing stands by harvesting a proportion of trees. 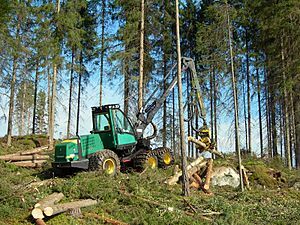 Logging usually refers to above-ground forestry logging. Submerged forests exist on land that has been flooded by damming to create reservoirs. Such trees are logged using underwater logging or by the lowering of the reservoirs in question. Ootsa Lake and Williston Lake in British Columbia, Canada are notable examples where timber recovery has been needed to remove inundated forests. Clearcutting, or clearfelling, is a method of harvesting that removes essentially all the standing trees in a selected area. Depending on management objectives, a clearcut may or may not have reserve trees left to attain goals other than regeneration, including wildlife habitat management, mitigation of potential erosion or water quality concerns. Silviculture objectives for clearcutting, (for example, healthy regeneration of new trees on the site) and a focus on forestry distinguish it from deforestation. Other methods include shelterwood cutting, group selective, single selective, seed-tree cutting, patch cut, and retention cutting. Trees are felled and then delimbed and topped at the stump. The log is then transported to the landing, where it is bucked and loaded on a truck. This leaves the slash (and the nutrients it contains) in the cut area, where it must be further treated if wild land fires are of concern. Trees and plants are felled and transported to the roadside with top and limbs intact. 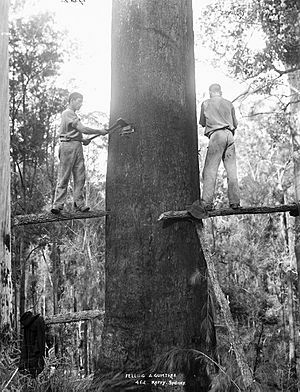 There have been advancements to the process which now allows a logger or harvester to cut the tree down, top, and delimb a tree in the same process. This ability is due to the advancement in the style felling head that can be used. The trees are then delimbed, topped, and bucked at the landing. This method requires that slash be treated at the landing. In areas with access to cogeneration facilities, the slash can be chipped and used for the production of electricity or heat. Full-tree harvesting also refers to utilization of the entire tree including branches and tops. This technique removes both nutrients and soil cover from the site and so can be harmful to the long term health of the area if no further action is taken, however, depending on the species, many of the limbs are often broken off in handling so the end result may not be as different from tree-length logging as it might seem. Cut-to-length logging is the process of felling, delimbing, bucking, and sorting (pulpwood, sawlog, etc.) at the stump area, leaving limbs and tops in the forest. Harvesters fell the tree, delimb, and buck it, and place the resulting logs in bunks to be brought to the landing by a skidder or forwarder. This method is routinely available for trees up to 900 mm (35 in) in diameter. Harvesters are employed effectively in level to moderately steep terrain. Harvesters are highly computerized to optimize cutting length, control harvesting area by GPS, and use price lists for each specific log to archive most economical results during harvesting. 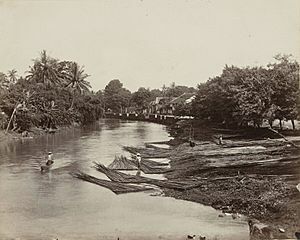 Log transport in the Dutch East Indies (now Indonesia) c. 1870. 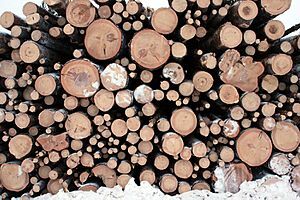 Felled logs are then generally transported to a sawmill to be cut into lumber, to a paper mill for paper pulp, or for other uses, for example, as fence posts. 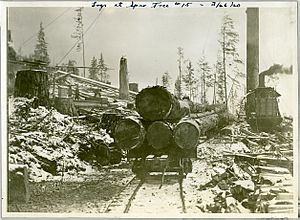 Many methods have been used to move logs from where they were cut to a rail line or directly to a sawmill or paper mill. 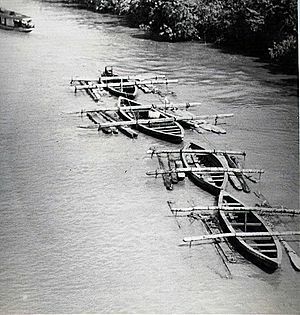 The cheapest and historically most common method is making use of a river's current to float floating tree trunks downstream, by either log driving or timber rafting. 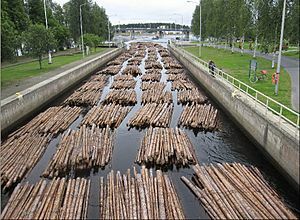 (Some logs sink because of high resin content; these are called deadheads.) To help herd the logs to the mill, in 1960 the Alaskan Lumber and Pulp Mill had a specially designed boat that was constructed of 1+1⁄2 inch (38 mm) steel. 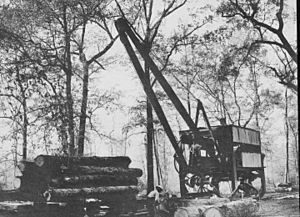 In the late 1800s and the first half of the 1900s, the most common method was the high-wheel loader, which was a set of wheels over ten feet tall that the log or logs were strapped beneath. Oxen were at first used with the high-wheel loaders, but in the 1930s tractors replaced the oxen. In 1960 the largest high wheel loader was built for service in California. Called the Bunyan Buggie, the unit was self-propelled and had wheels 24 feet (7.3 m) high and a front dozer blade that was 30 feet (9.1 m) across and 6 feet (1.8 m) high. Log transportation can be challenging and costly since trees are often far from roads or watercourses. Road building and maintenance may be restricted in National Forests or other wilderness areas since it can cause erosion in riparian zones. When felled logs sit adjacent to a road, heavy machinery may simply lift logs onto trucks. Most often, special heavy equipment is used to gather the logs from the site and move them close to the road to be lifted on trucks. Many methods exist to transport felled logs lying away from roads. 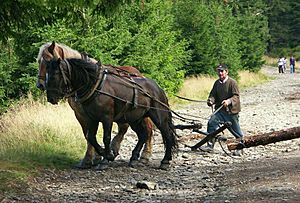 Cable logging involves a yarder, which pulls one or several logs along the ground to a platform where a truck is waiting. When the terrain is too uneven to pull logs on the ground, a skyline can lift logs off the ground vertically, similar to a ski lift. Heli-logging, which uses heavy-lift helicopters to remove cut trees from forests by lifting them on cables attached to a helicopter, may be used when cable logging is not allowed for environmental reasons or when roads are lacking. It reduces the level of infrastructure required to log in a specific location, reducing the environmental impact of logging. Less mainstream or now for the most part superseded forms of log transport include horses, oxen, or balloon logging. Logging Facts for Kids. Kiddle Encyclopedia.